"Batons [of] the Late Duke of Wellington." No. 1, the Baton of Portugal, is of burnished gold; it is surmounted by a Crown, and on a shield are the arms of Portugal. No. 2, the Baton of Prussia, is of burnished gold, and is of classic ornamentation; it bears two eagles displayed, holding the sceptre and orb of sovereignty. No. 4, the Netherlands. This is one of the simplest, but perhaps the most elegant of the batons, the Greek ornaments being introduced very tastefully. The arms of the Netherlands are in the upper division. No. 5 is the baton of Spain. . Like that of Portugal, it is crowned; but it is shorter in its proportions. It is of burnished gold, and bears the armorial ensigns of Spain. No. 6 (lying across in our Engraving) is Hanover. The crown and ends of the staff are gold; but the chief part of the baton is covered with crimson velvet, powdered with silver horses--the Hanoverian arms; and a silver horse is placed above the crown. No. 8, the baton of Russia, is of gold, and the alternate wreaths of laurel and oak, which twine round it; and the colklars round the staff are set with diamonds of great value. The ground is frosted gold. 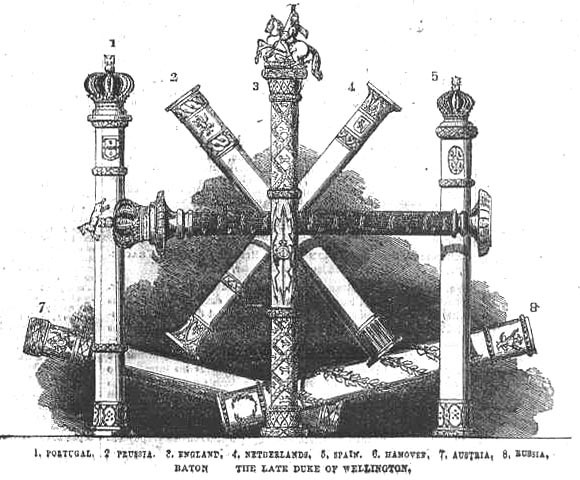 "Baton [of] the Late Duke of Wellington." The Illustrated London News. (11 December 1852): 532.